Rwanda gorillas are found in Volcanoes National Park or Parc National des Volcans . A permit is now at $750, this is simply conservation fee used for the welfare of the gorillas. Rwanda gorillas are just 2 hours away from Kigali City or Airport, the drive is very scenic as its through the rollings hills as Rwanda is known as a land of a thousand hills. Rwanda gorillas are habituated into Ten groups or families and only visitors are allowed to track per day per family with an accompanied park ranger Rwanda Gorillas are observed on a daily basis by the park rangers, thus there is a great assurance for sighting the rare mountain gorilla in all the locations or families. Gorilla Tracking needs some level of fitness as you have to search for them in the up muddy, steep mountain slopes for 1 or several hours depending on where they would have camped the previous evening yet at the end of the tracking, you fill very thrilled to have encountered these mighty primates interact with each other, eat, play. You are also allowed take some pictures to capture some of the interesting moments though with some restricts as you will read in the gorilla tracking rules. 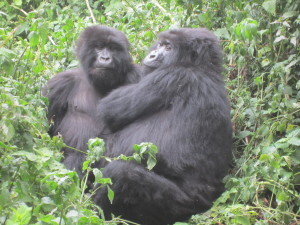 During the tracking, You may see the adorable babies, mothers or the silverbacks- head of the family; it is fun, unbelievable and breathtaking to be close to the great Mountain Gorillas, i am sure i have witnessed this and felt thrilled too just like you can hear other testimonies of those who have tracked before. Tracking Rwanda gorillas involves rules and guidelines that have to strictly observed, thus you don’t have to do anything that intimidates the gorillas lest they get angry and act wild. The tracking experience in the 3 countries in the virunga ranges that is Uganda, Rwanda & Congo is almost the same. Because of the dense forests, clear views are not always possible, sometimes the gorilla babies find their best moments feeding and playing on the top of the trees. They are like humans with the almost 95% of the DNA and with the intellectual capacity equivalent to the 5 year old child, The silverback is ever so protective. Rwanda Gorillas are the closest to track given the distance and can be done in 2 days minimum. 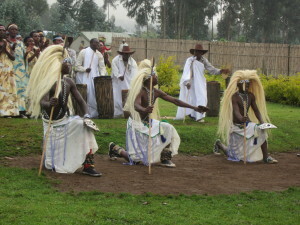 Rwanda Gorillas Tracking safaris are usually combined with the visit to the genocide memorial center to capture the sad history of the nation, visit to the museum and cultural perfomances by the local people. Not forgetting the visit to Lake Kivu, Akagera National Park and Nyungwe Forest. Rwanda is a beautiful country and worth spending your vacation. This entry was posted in East Africa Safaris, Gorilla Safaris Packages by Gorillas & East Africa Safaris. Bookmark the permalink.